Background: Matt Booth closed the doors on the Room 101 brand a while back in the wake of the proposed FDA changes where each and every blend would need to be registered (via a very hefty monetary process). 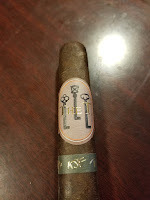 However he has been lured back into doing some blending / design work with Robert Caldwell (of Caldwell Cigars) with the Hit and Run, which we will be giving a review to in the near future too. Add to it that AJ Fernandez was in on the project for this smoke and you have our full attention. The T., originally called "The Truth", went through a quick name prior to release due to Tatuaje holding the trademark on that name. Appearance (0-20): This box pressed Nicaraguan puro looks great. The wrapper is a rich chocolate color with minimal veins and a clean, almost indistinguishable wrap line. The mixture of tobaccos on the foot show off what this is packing. There are no blemishes. 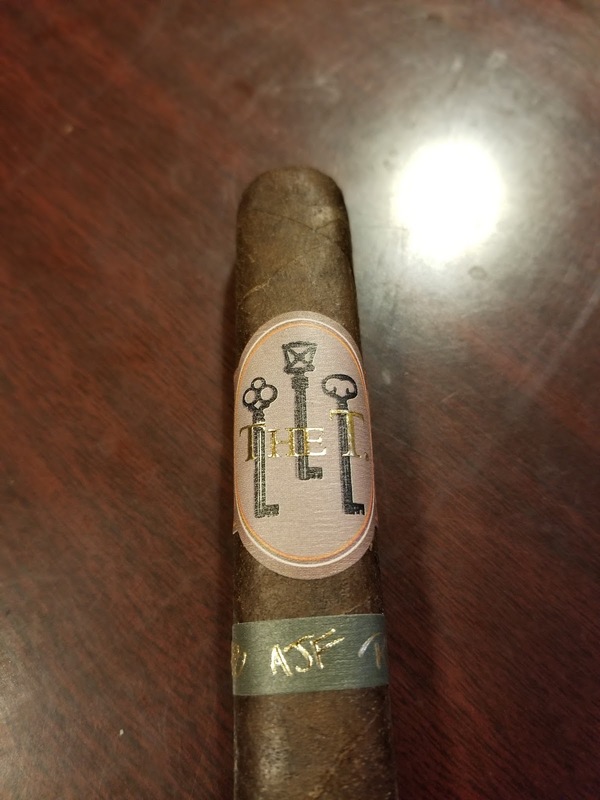 A prominent stone colored band is embossed with 3 different black skeleton keys (which I assume are meant to show the 3 differing personalities involved on the project) as well as a gold embossing that gives this the title, "The T." Matching gold embossing is on the secondary band with the initials of the three principal guys on the project (Booth, AJ, and Caldwell) and is placed on a green backdrop. Construction (0-20): When picking up the stick, there felt like there might be some small deviations in how the tobacco was spread throughout. The wrap and triple cap on top were expertly put together. Post cutting there is literally zero mess - everything held together with no tobacco splintering out at all. 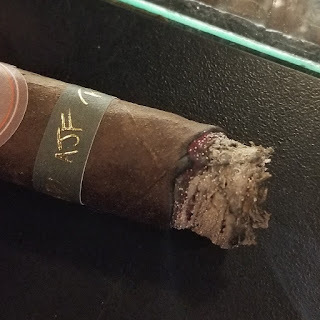 The initial draw was slightly tight, but it opened up when smoking through the stick to the point where it was just the right amount of resistance. The burn line remained relatively straight, but the ash held for a bit less than I would have liked. Strength (0-20): Medium to full is the billing, and it absolutely hangs in that range. It begins a little fit on the fuller end of things but settles down and hangs in just the right place. 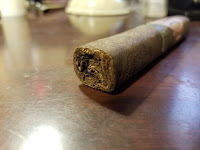 Flavor (0-20): The beginning of this stick contains a hint of pepper that is really prevalent on the retrohale. On the tongue there is a dark chocolate / coffee flavor that grants a slight bitterness with a light sweetness and cream to balance it out. The flavors work harmoniously through the first third, with some leather and cedar in the backdrop as it enters the second third. The pepper drops almost entirely on the retrohale, and becomes just a mere hint on the palate. The flavors of leather and earth are more prominent, but it still sticks with the bitter dark chocolate. Transitioning to the final third and it seems to revert back to the flavors found in the first third of the smoke - and its truly delicious. Value (0-20): $10.45 for a robusto isn't something that one would normally consider to be a "great value" unless it was a great cigar to go along with it. This one is the type that you'll be happy that you paid the price for - a premium product at a premium price. Overall (0-100): I am a bit skeptical when I see a collaboration between multiple people that seems almost... gimmicky. So let's cut to the chase - the T. was definitely worth both the money and the time to smoke. 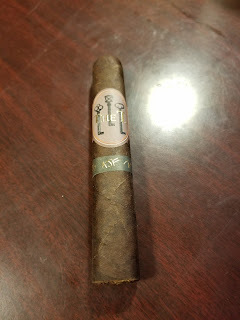 In fact I would go so far as to say it is one of the best newer blends that I have had in a while. There really isn't anything to complain about when smoking this cigar - its look good, is well made, holds well, has a fantastic flavor profile (initial pepper that fades, dark chocolate, coffee, leather, sweetness, and cream), and is priced well for all you're getting. The trio that put this one together really did strike just the right balance and have produced a smoke that I will absolutely be going back to.